Daytime action on Nozawa Onsen’s slopes is complemented after dark by an equally vibrant party scene: you might find yourself enjoying shots to a hip-hop soundtrack, or joining friends and strangers alike in a karaoke session. 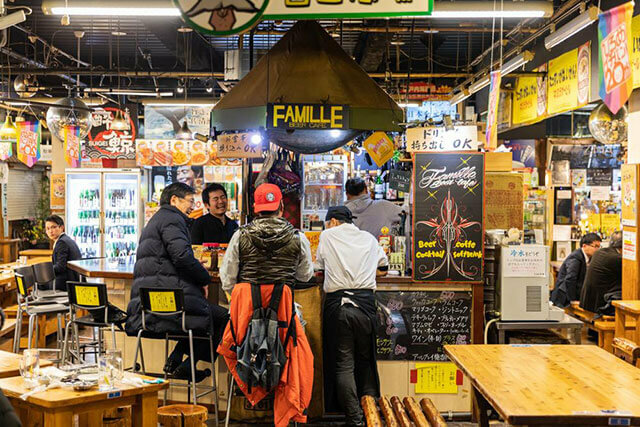 For those seeking a more mellow evening wind-down, the town offers a stylish and snug craft beer bar, along with a new night market dedicated to traditional Japanese street foods. This cozy basement bar lies at the bottom of a music memorabilia-bedecked staircase right on Nozawa’s main street. 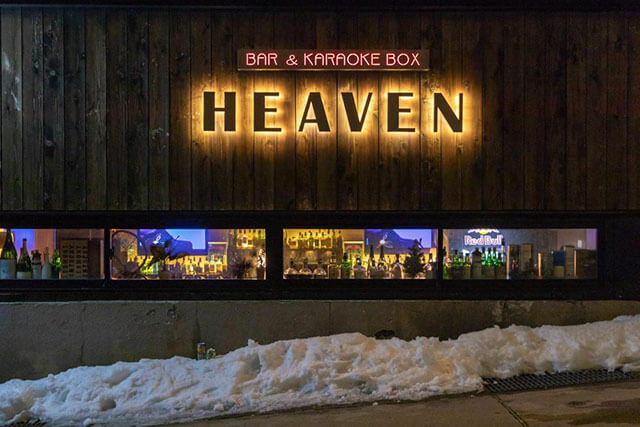 Specializing in bourbon and beer, but offering all kinds of drinks, Stay Bar is a key hangout for the expat community that has emerged around the town’s ski and snowboard scene. A full live band setup is ready in one corner for anybody who fancies belting out a song or two, and Stay’s owners are forever dreaming up all kinds of events, from Latin-style ‘beach parties’ to ’90s hip-hop nights, to keep the vibe going. 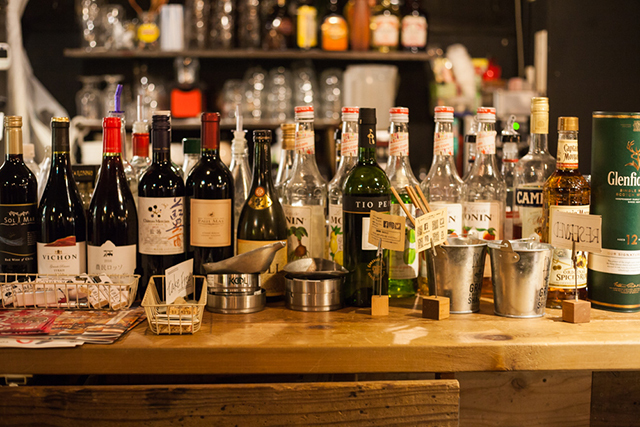 Drinks are mostly priced at around 500 yen. Kongo, newly opened as of January 2019, is a great addition to Nozawa’s nightlife and foodie scenes. A local steelmaker has transformed the bulk of his family-owned steelworks, located close to the Shinden bus terminal, into a nighttime food court that is already drawing crowds. Around a central court that has the feel of a traditional open-air village square, but is warmly enclosed under a cavernous roof, vendors offer classic, freshly cooked Japanese street foods such as yakitori (grilled skewered chicken) and oden (a ‘grandad’s favorite’ consisting of assorted vegetables and fish cakes stewed along with boiled eggs and konjac in a steaming broth). 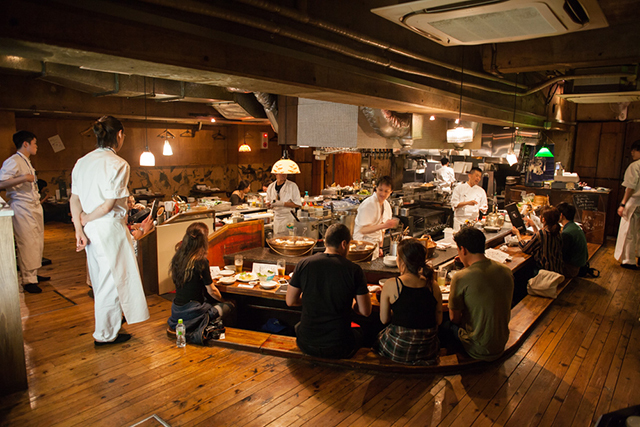 A handful of bars offer beers and sake, the traditional accompaniment to such down-home, hearty fare. Now perhaps Nozawa Onsen’s most glamorous venue following a stylish makeover (the weathered old signboard that for years delighted visitors by seemingly reading ‘snot bar’ has been replaced by pink neon), this roomy shot bar also houses a karaoke room accommodating up to 20 party people, as well as hosting occasional live music shows. The Yonetaro minshuku (traditional Japanese inn accommodation) houses a simple, no-frills eatery that offers substantial and delicious servings of ramen and other Chinese-inspired noodle dishes, to be enjoyed of course with the obligatory plate of grilled gyoza. These staples are joined by Japanese dishes that vary according to season: spring’s selection revolves around mountain vegetables hand-picked by Yonetaro’s owner, while autumn’s make extensive use of mushrooms. Dinner here will properly set you up for the night ahead. Nagano Prefecture is noted for its craft beers, and Nozawa Onsen itself is home to AJB (Anglo Japanese Brewing Company) which was founded by a British expat and his Japanese wife. The pair have also opened this stylishly minimal, standing-only taproom right next to their brewery, where visitors can sample a selection of AJB brews all made with purely natural ingredients, such as a ‘soba stout’ made with the same buckwheat used in soba noodles, or their signature Nozawa Onsen IPA. Libushi also occasionally offers guest beers from around the world, and a tasting set (2,000 yen) lets you try any four beers of your choice. Part of the Tanuki Lodge building which also houses rental accommodation; a cafe; and both Asian and teppanyaki restaurants, Tanuki Bar has a reputation as Nozawa Onsen’s premier live music venue. During peak season talented local musicians appear most nights of the week, providing a great soundtrack to a night enjoying Tanuki’s wide range of beer, sake, and whisky sourced from across Japan. This is one of Nozawa’s larger bars, attracting a mix of Japanese and foreigners with some imaginative cocktails, reasonably priced whiskeys, and a pool table flanked by several dartboards. Though Exiev is on the larger side, walls and counter bar seemingly formed by hundreds of interconnected blocks of wood lend the interior a warm and cozy vibe, and a small stage hosts live music and DJ events from time to time.